how would I get magic missiles Oskill on an item? not sure on what it would spawn, never seen it as Oskill yet, lovin' the guide chuck, keep it coming, my neutraldin is only 118 right now and my damage is only 7k per vessel, wondering in above post as to how I would get it to 50k? is that using SU items, im using angiris star for leech currently but I don't notice much compared to sacred armor/vindicate regen. 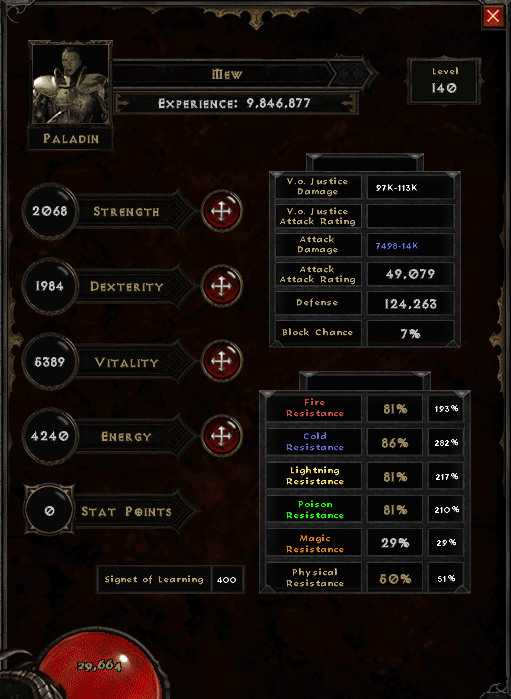 another friend of mine has 15k each vessel but he's much higher level, also ive been using exorcism oskill found on SU boots, I don't recall the name offhand, but its implicit mod gives it 50% more total damage. all rest of gear is crafted with eerie shrines as high as I could get it, and enough points to wear gear, rest into energy. any tips would be greatly appreciated! Moogrins wrote: Loving the caster Neutraldin, thanks so much for the guide. Derpus wrote: how would I get magic missiles Oskill on an item? not sure on what it would spawn, never seen it as Oskill yet, lovin' the guide chuck, keep it coming, my neutraldin is only 118 right now and my damage is only 7k per vessel, wondering in above post as to how I would get it to 50k? is that using SU items, im using angiris star for leech currently but I don't notice much compared to sacred armor/vindicate regen. another friend of mine has 15k each vessel but he's much higher level, also ive been using exorcism oskill found on SU boots, I don't recall the name offhand, but its implicit mod gives it 50% more total damage. all rest of gear is crafted with eerie shrines as high as I could get it, and enough points to wear gear, rest into energy. any tips would be greatly appreciated! How tanky is lazydin? How much deff and Hp he has with unique gear? I went for the melee paladin. How is it possible to max resist? I'm currently level 69 and I have all the TU, with 4 or 5 jewels that help my resists, thats all. Pinksagee wrote: I went for the melee paladin. How is it possible to max resist? I'm currently level 69 and I have all the TU, with 4 or 5 jewels that help my resists, thats all. Late game items also rolls very higher res. the rare amulet may also spawn with some resistances . If you want this damage i ahve you will have to veer off the guide a small bit but you can be IMMORTAL! you are making a terrible confusion . first of all , there is not just 1 way to play a neutraldin . there are at least 4 types of them that you can find in this thread . what happens after 120 is about endless farming for the SU's and SSU's required for the build to reach high numbers for the VoJ , as every craft you will be replacing with a SSU will boost the damage by a few thousands/tens of thousands . so you are actually telling the guy above who plays another type of neutraldin that he should just skip to 120 or above and get high end SU's gear , nothing more . anyone can do that with enough TG in the pockets , and so could you judging the screenshot . but what do you do if you are not being able to buy that high end gear and you must start a build/Sigma from zero ? it took me 2 weeks of intense farming and i still miss 1 or 2 of the necessary SSU's to reach above 100 k damage as lazydin .